So let’s get this straight. Somehow, unbeknown to U.S. intelligence agencies, a major army constitutes out of thin air and in the space of about ten days captures huge Iraqi metropolitan areas and now threatens the Iraqi capital. In the north, Kurds take over a major city they’ve been eyeing for about a thousand years. Elsewhere, tens of thousands of Iraqi soldiers also fold like tents leaving millions of dollars of munitions, tanks and helicopters in the hands of an advancing army so extreme in its beliefs of Sharia law and a hardline Islamic state that, they have actually been disowned by Al Qaeda. The only thing standing in the way of ISIS (Iraq/Syria Islamic State) and Baghdad are volunteers formed after Friday prayers- oh- and our good friends, the Iranians, who have pledged to help defend the capital. 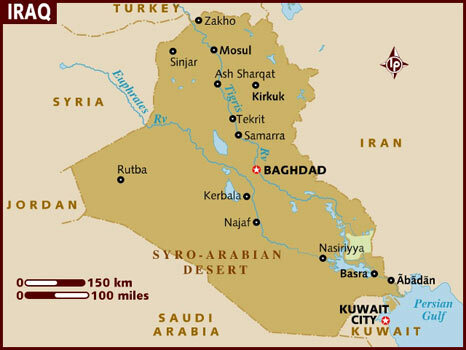 Who’s to blame for the possible collapse of Iraq into complete and utter chaos? 1) The British. They’re the ones who sat in some fancy room after the end of World War I and drew up the boundaries of Iraq with apparently zero thought given to the politics of the various ethnic and religious groups in the country; the Kurds to the north, the Sunni and the Shiites. 2) The Bush administration. Not the first one, the second one. The first Bush White House never completed its invasion of Iraq or toppled Saddam Hussein because of the uncertainties of what might occur if a sudden power vacuum were to open up smack in the heart of the Middle East. Plus, we had no interest in accidentally starting and getting involved in a bitter civil war. The second Bush administration did what it did, and praise them or scold them, the fact is the war and its aftermath ended up putting a Shiite leader in place who has spent the last 8 years taking out several centuries worth of anger against the minority Sunni population that had previously lorded over the majority Shiites. 3) Prime Minister Nouri al-Maliki. Not only has he alienated the Sunnis, but it is reported his government is corrupt as the day is long; so corrupt, in fact, that in Mosul, a city of about 2 million people that just got taken over by ISIS, the violent invaders have actually improved city services by, among other things, ending frequent power outages. Of course, in the decree they made public upon their takeover, women are not allowed to leave their homes and anyone in violation of their strict interpretation of Sharia law will be hung or have their feet or hands cut off. But they do get air conditioning. 4) The Obama administration. Responding to an electorate weary of war, and now the victim of what his defenders call disingenuous and hypocritical attacks from those who started the war- his administration has, nevertheless, presided over a national security and intelligence apparatus that has pretty much missed one of the biggest developments in modern Middle East history.